Hedgehog Spruce is a slow growing, dwarf evergreen shrub that forms a mound. It has bluish green needles and will hold its color through the winter. It will grow to a height of 2' high and 2' wide. Hedgehog Spruce likes to be planted in full sun. 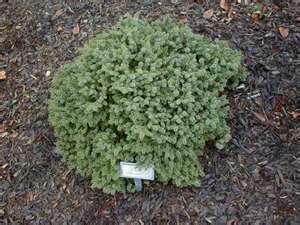 Use this dwarf shrub in a rock garden, miniature garden, or as a specimen. It is a great choice for a Bonsai specimen. Hedgehog Spruce is also deer resistant.